Toyota has taken the Century into its third generation by unveiling the new model ahead of its public premiere scheduled for the 2017 Tokyo Motor Show. Still limited to the Japanese market, the flagship saloon carries an evolved styling, albeit on a larger scale, as it's now 5,335mm (210in) long, 1,930mm (76in) wide, and 1,505mm (59.2in) tall, with a 3,090mm (121.6in) wheelbase. Despite the classic look, the 2018 Toyota Century is equipped with the brand's latest technologies. The list is long, and it has yet to be fully detailed, but it does count adaptive projector LED headlights, specially tuned suspension, which, in combination with the newly developed tires increase the ride comfort and reduce road vibration, active noise control system, and the Safety Sense P driver assistance equipment. Having a larger footprint means that its interior is roomier than ever, and it comes with plenty of gadgets, including two individual rear seats, which can be controlled via a large LCD panel located in the central arm rest. The display can be used to access the air conditioning and sound system, and for extra credit, Toyota has thrown in a 20-speaker premium audio system too. Other features found inside are the reading light, writing table, and rear-seat entertainment, in addition to the high-quality materials used throughout the cabin, such as leather and wool-upholstered seats, depending on the selected grade. At its heart, the 2018 Toyota Century carries a 5.0-liter V8 engine that has been hybridized. No technical details have been released so far, but the automaker claims that it's "in pursuit of the lowest fuel consumption in its class". 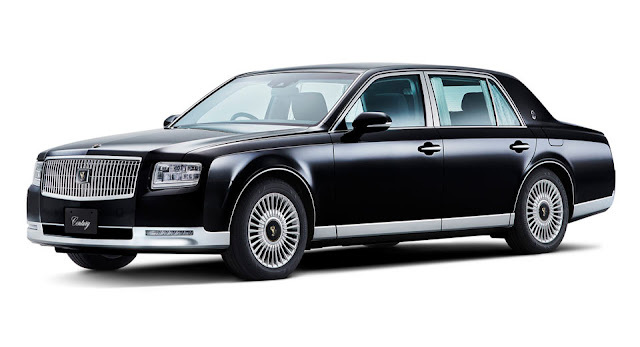 0 Response to "2018 Toyota Century Is A Modern Flagship With Old School Styling"